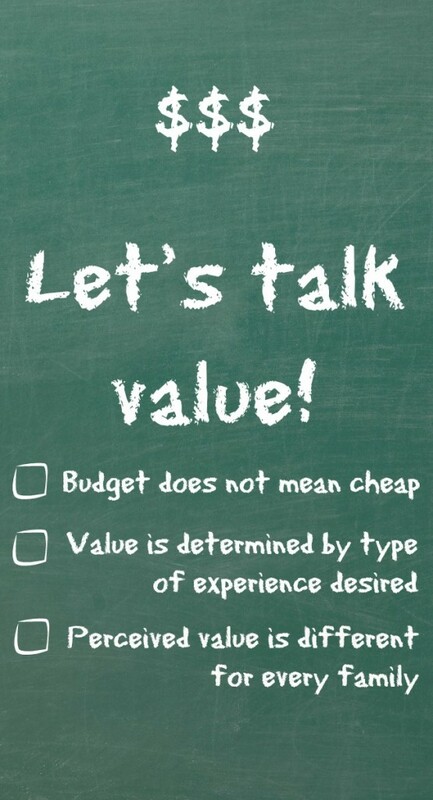 Home » budget » Let’s talk value! Budget does not mean cheap! I’ve said it many times, and I will say it again. Budget means value. When grocery shopping, I compare prices to get the best value for my dollar. Sometimes, I buy store brand. It’s often the cheapest, and if it tastes just as good as the name brand, it’s a great value. Sometimes, I buy store brand and it tastes awful (mac-n-cheese especially… at least to me). That’s not a good value, because if I don’t like it, I won’t eat it. In fact, bad store brand food is a horrible value because I paid for something I won’t use. Vacation budgets are no different. Let’s say I want to vacation at the beach, feel the sand between my toes and enjoy some saltwater taffy. Doesn’t that sound fun? I do the research and find a hotel for $80/night at a nice beach about 4 hours from home. Total, the hotel costs $560 and gas for the car costs about $90. So, for $650 I get a decent vacation. But, what if during my research, I find a hotel deal “near the beach” for $30/night and take it instead? Sounds great…. Unless, it’s for a for a no-frills motel alongside the highway that most people wouldn’t consider vacation destinations. Imagine the disappointment! Budget does not mean the cheapest thing around. Budget means the best value for the vacation dream. Sometimes, it includes a splurge — or two or three. Sometimes, it means eating most meals “at home” and enjoying the amenities of the resort. Sometimes, it means camping on the cheap and enjoying the fresh air (though I do require a cabin and indoor plumbing). Value is determined by the type of experience desired. We took a cruise from LA to Mexico a few years ago. Cabin options for a family of five were a bit limited. In the end, we spent an extra $600 for a concierge level suite and enjoyed the perks immensely. When a hurricane turned our weather gray, windy and cold, we appreciated the extra attention provided. For less than $100/day, our whole family got private dining for breakfast, “free” beverages, reserved seating in the main theater and expedited check-in. In making the choice, we determined that for us, the value was worth the extra expense. When we traveled to China in 2005, I longed for a business class seat to stretch my legs and get some sleep. However, that pricey seat cost $2,000 more than my $900 coach fare seat. No matter how I longed for that cushy seat, I couldn’t justify the expense (well….. maybe if I wouldn’t have felt guilty for leaving my whole family behind in coach I could have done it. LOL). The trip to China was already quite expensive and adding the business class fare didn’t add enough value to the overall trip to justify the expense. On a vacation to Hilton Head many years ago, we rented a vacation condo to keep expenses down. It cost no more than a regular hotel room, but offered the convenience of a kitchen, living area and laundry. When traveling with young boys, these amenities are priceless! We brought our own, easy-cook meals and ate out only a couple of times, making the trip even cheaper. With the savings, we splurged on a dolphin tour. Even though my boys were only 3 and 6 at the time, we still talk about that dolphin tour. I know my younger son doesn’t remember “driving the boat” (we were the only family on the tour, so the guide let him steer in clear water), but the story lives on. Ben zig-zagged his way across the water, laughing the whole time as he “d’ove the boat.” The value of that dolphin tour, which was an expensive splurge, was worth every penny. Perceived value is different for every family. On the blog, I sometimes review inexpensive vacation attractions or destinations. Farmer’s markets and street festivals are great examples of budget attractions that will never break the bank. Sometimes, I share splurge attractions, like Grosse Savanne Eco-Tours, Culinary Tours and higher end cruises. Either way, they fit the “budget” term — because I am determining value for the experience. When I share information on destinations and attractions, I try to include objective information to help you determine whether the experience is a great value for you or not. I hope I include enough information to help you plan well. If you ever have questions, please email me, tweet or facebook me. I’ll do my best to help. May your travels be blessed… wherever you go and whatever your budget! I agree completely! It is so refreshing to see someone on the same page as me when it comes to this topic. Sometimes we budget more or less for things, depending on the experience we want from our vacation. It can be low cost or not, but once we figure out what the budget will be, we do our best to stick to it. The best value is the key point, trying to get as much as you want or need for a lower price. No different than buying a home or anything else, it is about value. We love to travel as a family. Knowing what you can spend and what can come up as a surprise is important. Some years ago, I got to take my first business and first class flights thanks to a benefactor. After that it became really difficult to go back to coach for long-haul international flights. So what I’ve done is learn how to collect frequent flyer miles. I concentrate on a couple of major airlines and then can get business and first class tickets for a very reasonable price. Nice! Saving the points for those long flights is key! I have to agree with you on all of this indeed. You point out some great helpful points. It sometimes doesn’t pay to go cheaper. Thanks for sharing. Thanks a lot for such a great tips. Helpful to make decision those are stuck with tight budget plan. I agree that ‘Budget does not means cheapest things around’. When I plan my vacation, My husband takes the major part in budget planning & every thing else. Fathima, our family gets in on the action too! It’s nice planning together. I think we all look forward to vacation more, and I am certainly less stressed in the decision making process. I’m not so smart…. Just do this more than most! You make me laugh and I’ll help you budget better. Deal? Great tips. I tagged along with my husband a few months ago to San Antonio. The hotel he was staying at included breakfast and dinner. It was a cheap getaway overall. Don’t be afraid to ask the hotel what’s included with your stay. By the way the hotel was a Drury inn. Very nice rooms and hotel. NICE! We stayed at a chain hotel that offered breakfast and dinner recently, not knowing dinner was included before booking. NICE surprise!!! great tips. we budget for travleing and it’s a great thing for our kids to learn. It might even be easier for kids to learn budgeting for vacation, which they get to experience quickly and vividly, than for other things that are far away. Great strategy to teach frugal living and decision making. Evertime vacation comes around, always got to plan it all out and make a budget. I totally get the grocery analogy -not a bargain if it ends up in the trash. On our last trip to Disney we stayed at a resort–co$t a lil more then some other places….but we didn’t eat out every night because we could cook there. For us it’s was a splurge vacation. The memories we make are priceless! I agree with you–value has different meaning to different people. You really have to be careful when buying store brand food–if you end up throwing it out–where is the money saved? I try to stick with a budget for everything grocery shopping, vacations, birthday parties and even Christmas. But just like you I wont buy a brand of food the whole family dislikes just to save money. In the end it would be a waste, because no one would eat it! I think that example stuck! It’s the exact same with vacations — if you go super-cheap and no one enjoys it, was it really worth it? On the flip side, when you pay top dollar is it always worth the extra paid? What if you get a fantastic vacation hotel with a lovely view and everything is perfect except that there’s a sudden storm while you’re there? 🙂 Is that still considered great value? just kidding. Awesome tips! You are absolutely right. Budget does NOT mean cheap. A lot of people have that misconception. Thanks, Virginia! Hopefully, this will help make decision making easier, especially for those on a really tight budget! The China trip was really long…. I think that justifies the price? Maybe? The whole trip worked out okay, though. We were crammed in like sardines on the way there, but on the way home (back in the day when you could change seats easily), I found two rows of 3 and claimed aisle/window and put a kid in the aisle seat of the center section. We got 7 seats for the price of 4 and I was able to sleep sideways with Ellie in one row. 🙂 That would never happen today, though. Ah, business seats! I would love to fly business too, if the budget permits. Most of the time, however, it does not. Haha!